“There have been no more than 10 sightings of these spiders here,” Mr Geiszler said. “There is definitely not an invasion or a plague or anything like that”. Yep, stand down folks. There are ‘just a few’ of these things. In fact, despite the quotes universally ascribing ‘terror’ or ‘horror’ to the locals, none of them seem to exhibit any such emotion. 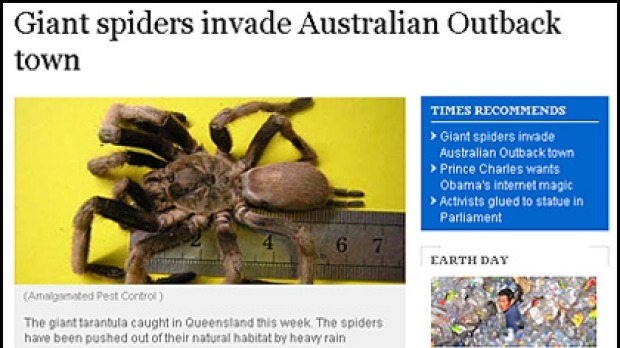 Maybe outback Australians are as pragmatic when it comes to spiders as they famously are about everything else. And although the spiders are indeed quite big, and will bite, they haven’t actually harmed anyone so far. Well, I think we can assume they haven’t, or goodness knows what headlines we’d have to contend with. I have to giggle every time I read something about “deadly, man hunting etc” tarantulas. I keep tarantulas as pets, have caught them all myself… They can’t kill you, yes they MAY make you sick for a few hrs but its no worse than being allergic to a wasp sting. Big spiders in Australia? That’s news? Next Next post: They should worry!